I am new to here and new to DLMS protocol but thank you to create a such a nice open source library. It helps me to understand better. I am a software developer and using your .net library and have 3 errors. Firsly, my test device is Landis+Gyr E450 and its from Switzerland. (I tried to give a password but do not what is the password so I have "-P HELLO" and change Authentication as LOW but not working. PS: I am trying to readout via an opto-header which is connected between usb port (serial com7) and the device. Read scalers and units from the device. Error! GXDLMSAssociationLogicalName 0.0.40.0.1.255Index: 2 Das angegebene Argument liegt außerhalb des gültigen Wertebereichs. System.ArgumentOutOfRangeException: Das angegebene Argument liegt außerhalb des gültigen Wertebereichs. bei Gurux.DLMS.Reader.GXDLMSReader.Read(GXDLMSObject it, Int32 attributeIndex) in C:\Users\erd\Development\Dlms\Tests\Gurux.DLMS.Net\Gurux.DLMS.Client.Example.Net\GXDLMSReader.cs:Zeile 866.
bei Gurux.DLMS.Reader.GXDLMSReader.GetReadOut() in C:\Users\erd\Development\Dlms\Tests\Gurux.DLMS.Net\Gurux.DLMS.Client.Example.Net\GXDLMSReader.cs:Zeile 644. Error! GXDLMSAssociationLogicalName 0.0.40.0.1.255Index: 7 Access Error : Device reports Read-Write denied. 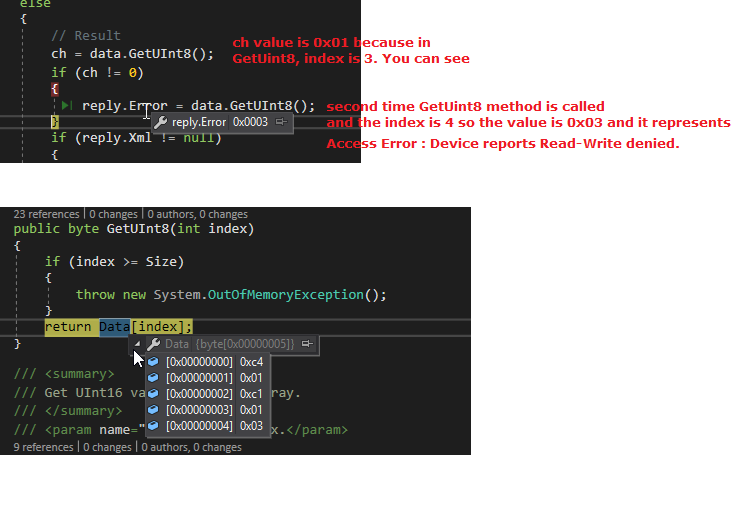 Gurux.DLMS.GXDLMSException: Access Error : Device reports Read-Write denied. bei Gurux.DLMS.Reader.GXDLMSReader.ReadDLMSPacket(Byte data, GXReplyData reply) in C:\Users\erd\Development\Dlms\Tests\Gurux.DLMS.Net\Gurux.DLMS.Client.Example.Net\GXDLMSReader.cs:Zeile 777.
bei Gurux.DLMS.Reader.GXDLMSReader.ReadDataBlock(Byte data, GXReplyData reply) in C:\Users\erd\Development\Dlms\Tests\Gurux.DLMS.Net\Gurux.DLMS.Client.Example.Net\GXDLMSReader.cs:Zeile 809.
bei Gurux.DLMS.Reader.GXDLMSReader.ReadDataBlock(Byte data, GXReplyData reply) in C:\Users\erd\Development\Dlms\Tests\Gurux.DLMS.Net\Gurux.DLMS.Client.Example.Net\GXDLMSReader.cs:Zeile 795.
bei Gurux.DLMS.Reader.GXDLMSReader.Read(GXDLMSObject it, Int32 attributeIndex) in C:\Users\erd\Development\Dlms\Tests\Gurux.DLMS.Net\Gurux.DLMS.Client.Example.Net\GXDLMSReader.cs:Zeile 848. Error! GXDLMSAssociationShortName 0.0.40.0.2.255Index: 3 Der Wert für einen UInt16 war zu groß oder zu klein. System.OverflowException: Der Wert für einen UInt16 war zu groß oder zu klein. Error! 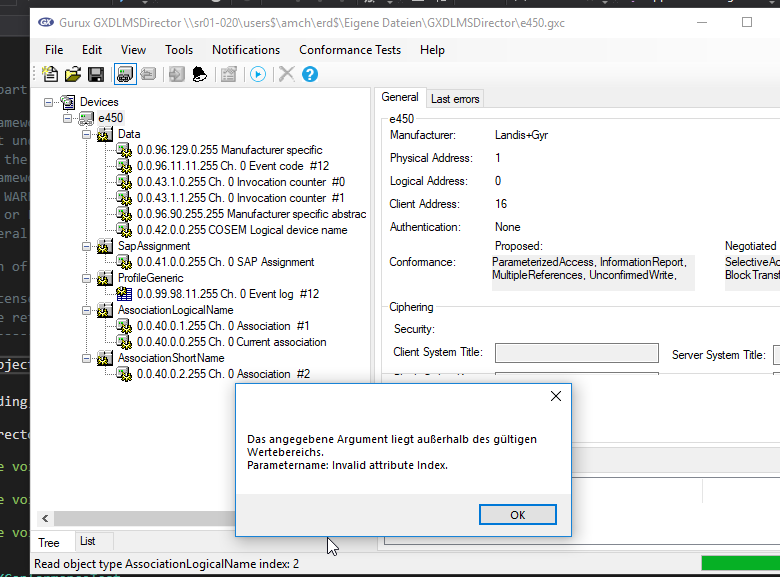 GXDLMSAssociationLogicalName 0.0.40.0.0.255Index: 2 Das angegebene Argument liegt außerhalb des gültigen Wertebereichs. Error! GXDLMSAssociationLogicalName 0.0.40.0.0.255Index: 7 Access Error : Device reports Read-Write denied. Error! Failed to read first row: Access Error : Device reports scope of access violated. Ended. Press any key to continue. this code is not good because it directly throws an exception when an index cannot be found. As you will see, the attributes do not contain this index value. This code piece is executed 2 times, I dont know why but 2 times this error occured. 2- This error seems that it is related with Authentication. But I did not find any relation for it. In the GXDLMS.cs class and in HandleGetResponse method. I have this error. 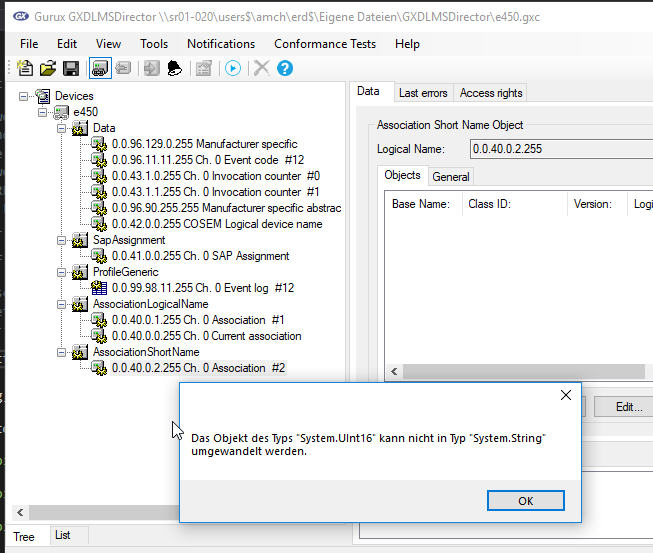 As you can see in the log, LogicalName is same but Index 7 makes this problem..
in the GXDLMSAssociationShortName class and in the UpdateAccessRights method. I tried to solve those problems but until now I have not achived yet. I am ready to provide you extra information and I can let you to connect my computer remotely if its needed. Finally, I tried to readout by using GXDLMSDirector application. It works somehow but I got the same error while I am reading AssociationShortName. This error is my first error (above). And the other one, when I right click on AssociationShortName's item (0.0.40.0.2.255 Ch. 0 Association #2) and select "Read" item. I got may third error (above). PS: I have not see "my second" error with this app. I hope you can help me to solve these problems. I am really trying a lot of things but until now, no solution. 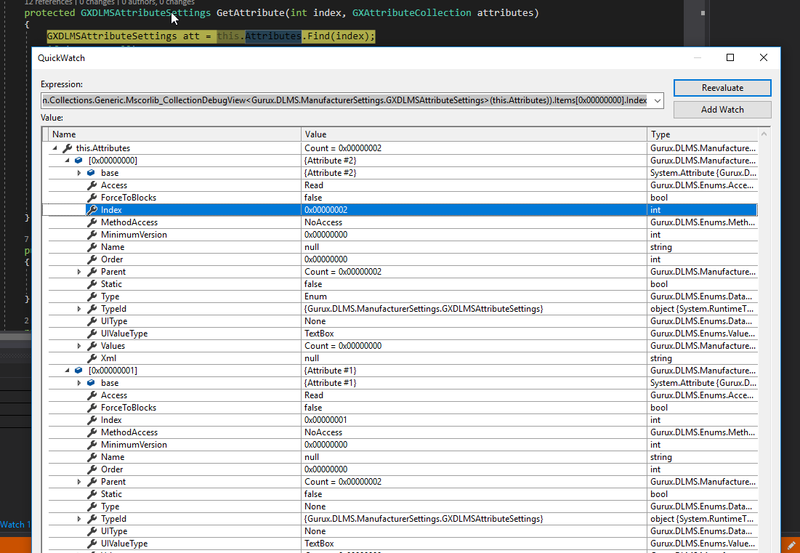 Meter returns attribute index that is outside of boundaries given in DLMS standard. Only thing what we can do it throw an exception. Your meter is not allowing to read this attribute. Usually it's not implemented. This is general error and it's OK. Don't read that. Short name is always UInt16. Can you Send your trace file to me by email? That issue number 3 is bothering me. We are reading L+G E450 meters, but that is not happening.